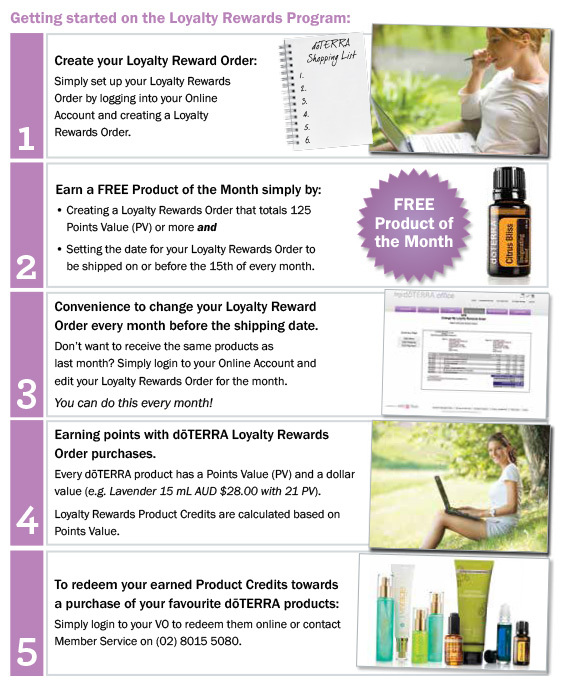 New Wellness Advocates who enrol with a Natural Solutions Kit (International – 400 PV) or Daily Usage Kit (Local – 400 PV) and have a 100 PV Loyalty Rewards order the following month will receive: • 100 LRP points • Start LRP point accrual at 15% New Wellness Advocates who enrol with an Every Oil Kit (International) or Oil Sharing Kit (International and Local – 1000+ PV) and have a 100 PV Loyalty Rewards order the following month will receive: • 200 LRP points • Start LRP point accrual at 20% New IPCs who enrol with a Diamond Kit (International only – 2000 PV) and have a 100 PV Loyalty Rewards order the following month will receive: • 400 LRP points • Start LRP point accrual at 25% * Only first-time Wellness Advocates who purchase an enrolment kit listed at 400 PV or higher qualify for the Loyalty Rewards Fast Track Program. 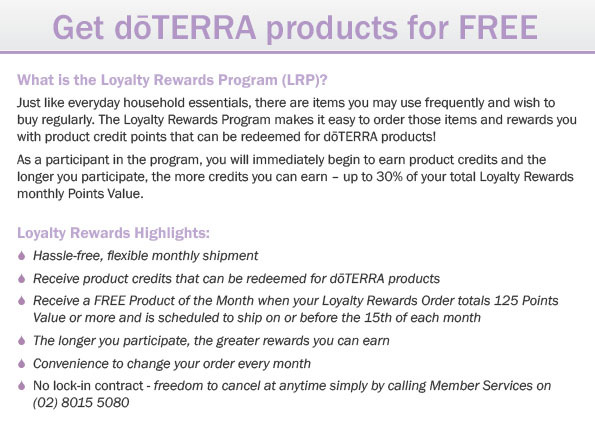 * Loyalty Rewards Fast Track enrolment orders are not LRP orders and may not count towards Power of 3 bonuses or other LRP benefits. * Points will be redeemable 60 days following enrolment.